Each year, Cosmetic Executive Women (CEW) recognizes innovations within the beauty industry with their Beauty Insider Awards. This year, Teadora has been awarded the Sustainability Excellence Award, which recognizes one brand that has made efforts to operate responsibly and with sustainability in mind. Judging criteria for this award extends far beyond all other CEW categories, requiring brands to not only submit a detailed entry, but to also present in front of a panel of judges in New York City. The CEW Sustainability Excellence Award is scored across four categories of sustainability based on principles outlined by The Natural Step, an international non-profit organization dedicated to sustainable business development. The criteria for judging includes how a brand: reduces the usage of fossil fuels and mined materials, reduces the introduction of non-biodegradable materials in the in environment, reduces the loss or damage of natural resources, and demonstrates consideration for peoples’ needs and rights. Teadora’s brand ethos is built on four pillars: creating a responsible and continually improving supply chain, promoting consumer education, empowering local communities and leading and supporting environmental activism. The brand built their comprehensive approach to sustainability through practices such as beach harvesting with Amazonian communities, local economic empowerment initiatives and relying less on man-made substances. Among the brand’s many initiatives is their trademarked give-back program, “Earth For You. You For Earth,” which strives to plant one million trees and preserve seventy-five thousand acres in the Amazon Rainforest over the next five years. In Portuguese, “Teadora” means adores you. Teadora shows their love for the world with natural and organic products made with exotic and effective rainforest ingredients. 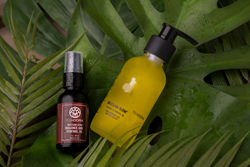 Toxin-Free, Vegan, Cruelty-Free, Sustainably Harvested and Made with love in the USA, their products let you experience the bounty, wisdom and magic of the Amazon – while helping to improve the lives of the communities where we live and do business. Teadora, a B-Corp Certified company, helps to fund a philanthropic exchange between the U.S. and Brazil to promote rainforest conservation, education and leadership development. For more information please visit http://www.teadorabeauty.com. CEW is a global community of 8,000 members defining the future of beauty. It is the pre-eminent beauty organization bringing together a passionate group of professionals at every stage of their careers, from every facet of the industry. By creating a forum of collaboration, idea exchange and growth, CEW helps its members and the industry as a whole take empowered next steps toward a more beautiful future. For more information, please visit http://www.cew.org.